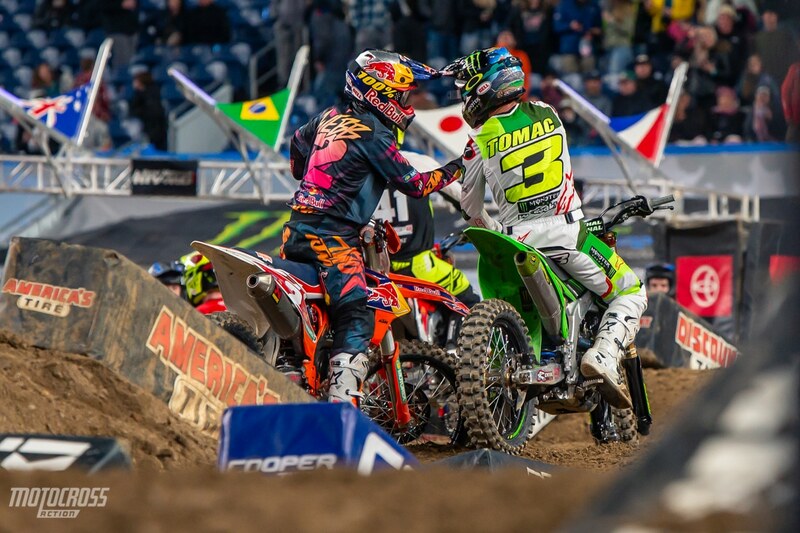 Eli Tomac and Cooper Webb have battled hard, but they’ve also displayed some good sportsmanship. 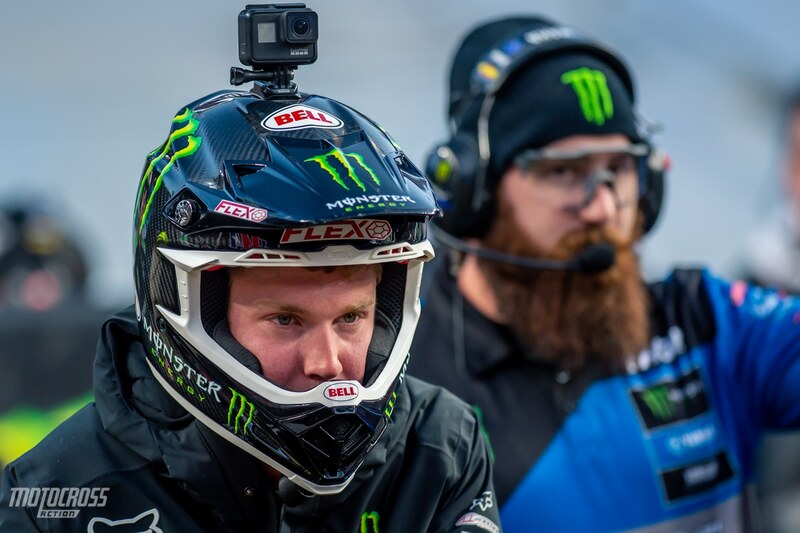 For the first time in 23 years, the Monster Energy Supercross series went back to Denver, Colorado, and the race was a huge success! 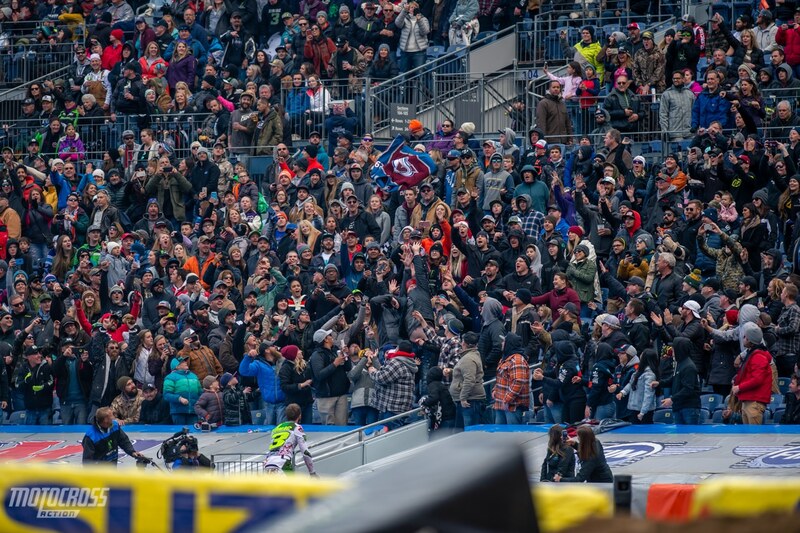 The crowd was alive and cheering loudly for their favorite riders. Although the fans were having a great time, there were also a lot of challenges that came with racing in the Mile High city. A few of them being cold weather, snow, slower bikes and thinner air. 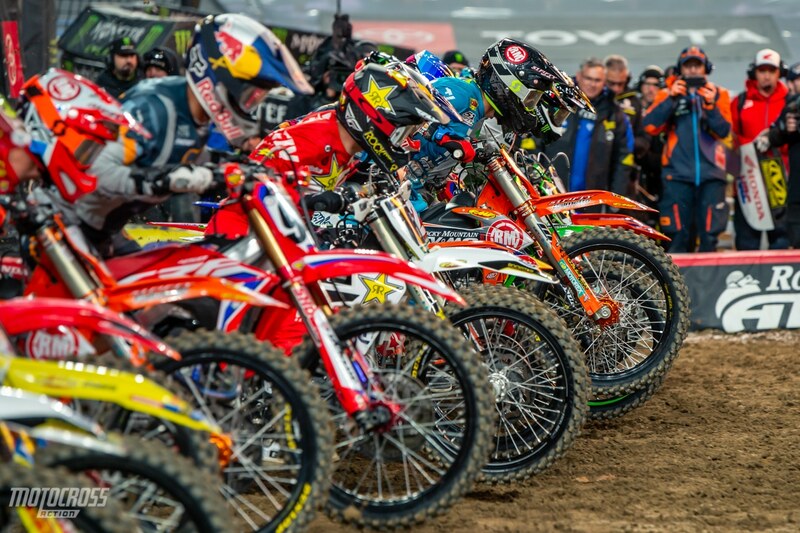 These factors made racing Supercross even more challenging for already challenging event. 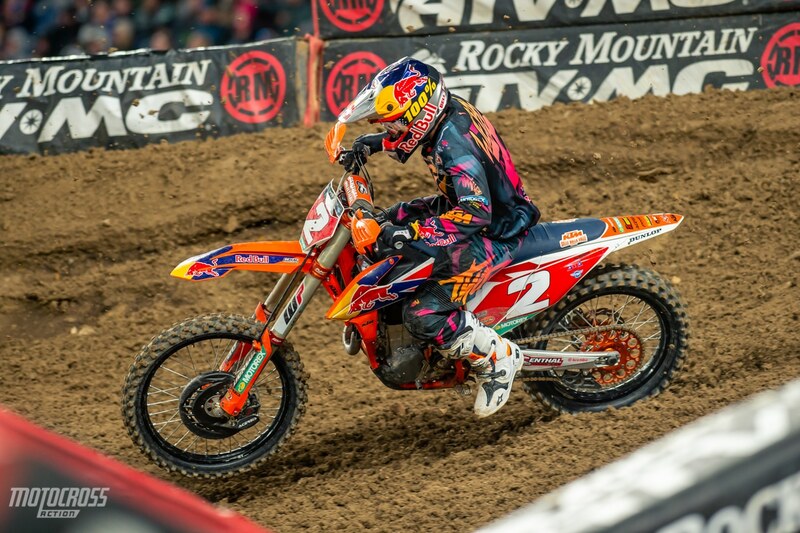 The Denver dirt was another added degree of difficulty as it developed to be the most hard pack and slick track of the year. 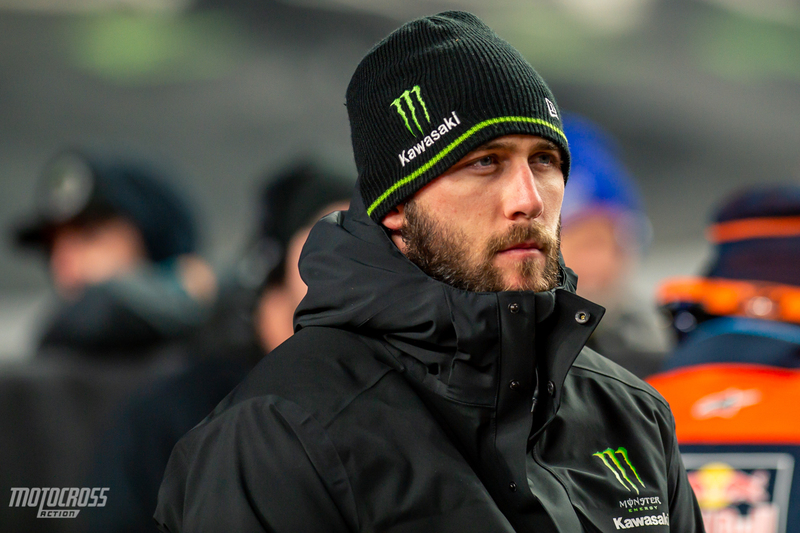 Eli Tomac lit the stadium on fire with his speed and aggressive passes. Cooper Webb was fast as well, he passed his way up to second and grabbed his 11th podium of the year. In the 250 class Michael Mosiman grabbed the holeshot and mixed it up with the two title contenders, Adam Cianciarulo and Dylan Ferrandis. How would it all shake out? Find out here in Motocross Action’s The Aftermath. 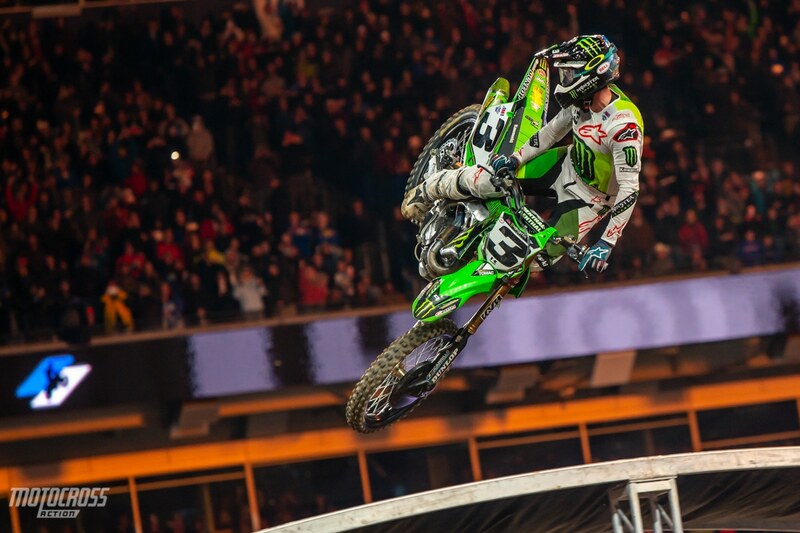 “The Colorado kid” Eli Tomac was on fire in his home state. 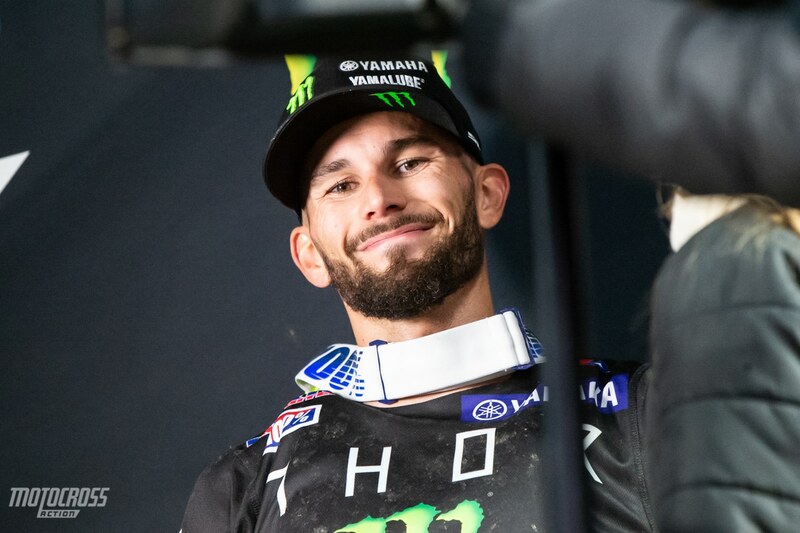 It was clear that the Denver crowd favored Eli Tomac and they went crazy here when he looked over at the crowd on the last lap of the 450 main event. Check out all the fans cheering in the background. In case you missed it. 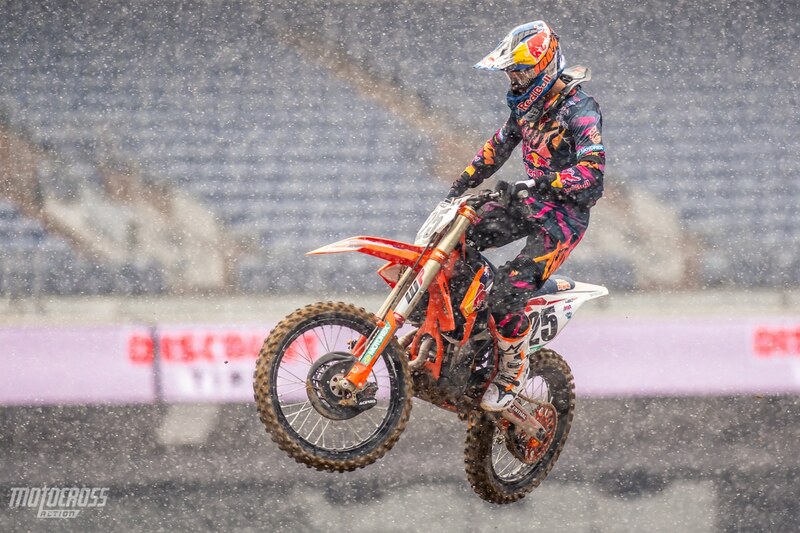 There was an actual snow storm during the second timed-qualifying session in Denver… It was 33 degrees, so it melted right away. But the extra moisture made the already hard packed track, even more slick. 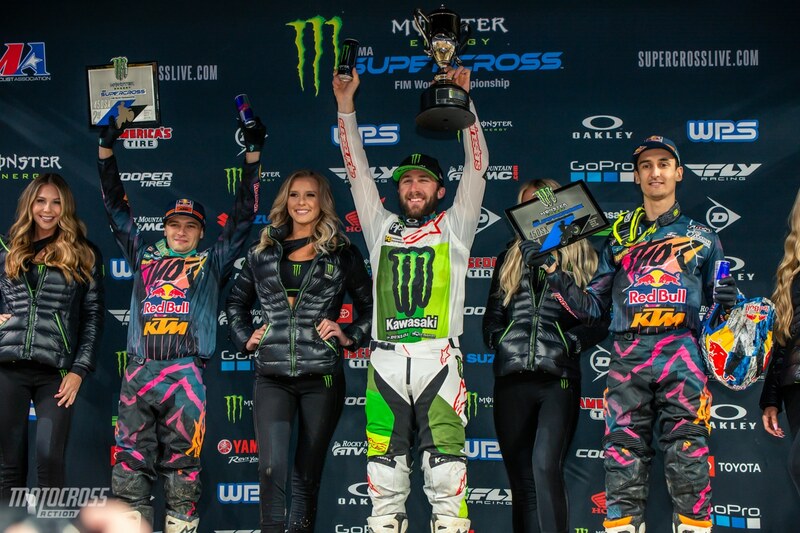 For the third time this season, Eli Tomac, Cooper Webb and Marvin Musquin shared the 450 Main Event podium. After 15 rounds, Webb has 11 podiums, Tomac has 8 podiums and Musquin has 10 podiums. 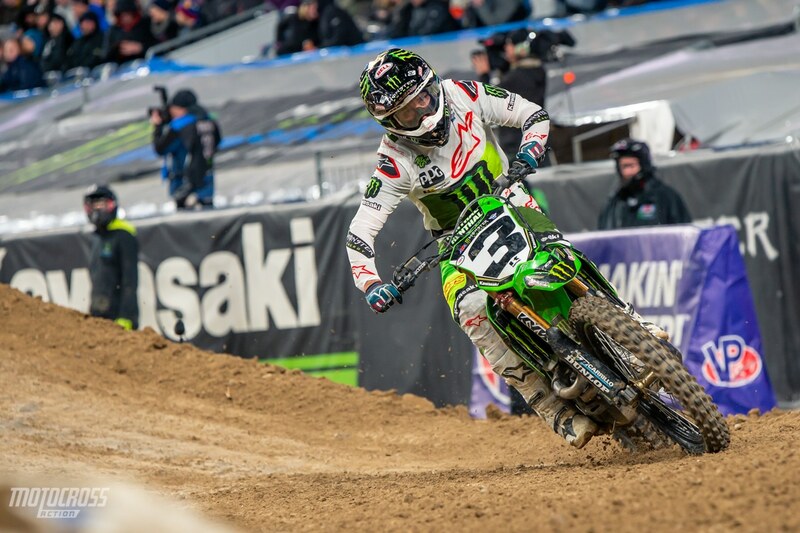 Eli Tomac stands around a technical 90 degree corner. 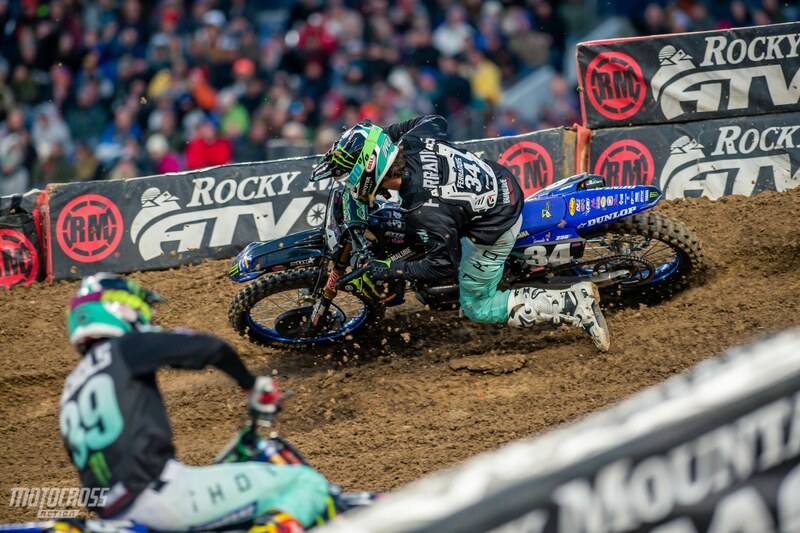 As you can see, the track was very hard packed and blue groove in Denver. Riders were struggling to find traction all day. Throttle control and momentum were very important, if you lost your momentum, it was hard to get it back. 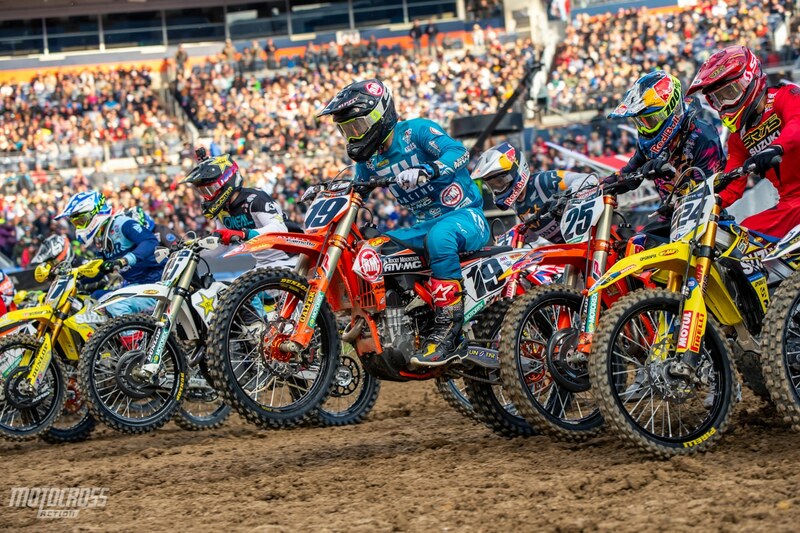 In the 450 main event, Marvin Musquin, Joey Savatgy and Justin Bogle ran first, second and third and they finished third, fourth and fifth by the end of the 20-minute plus one lap main event. 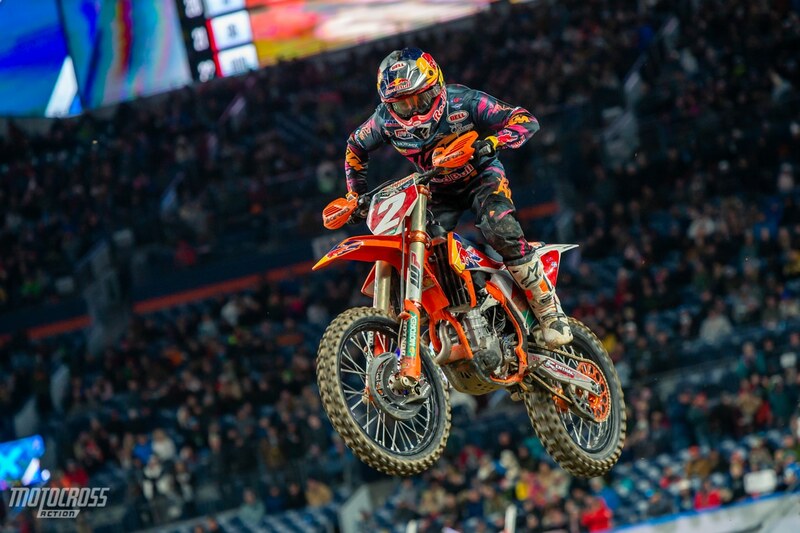 Musquin was third, Bogle finished fourth and Savatgy dropped to fifth. 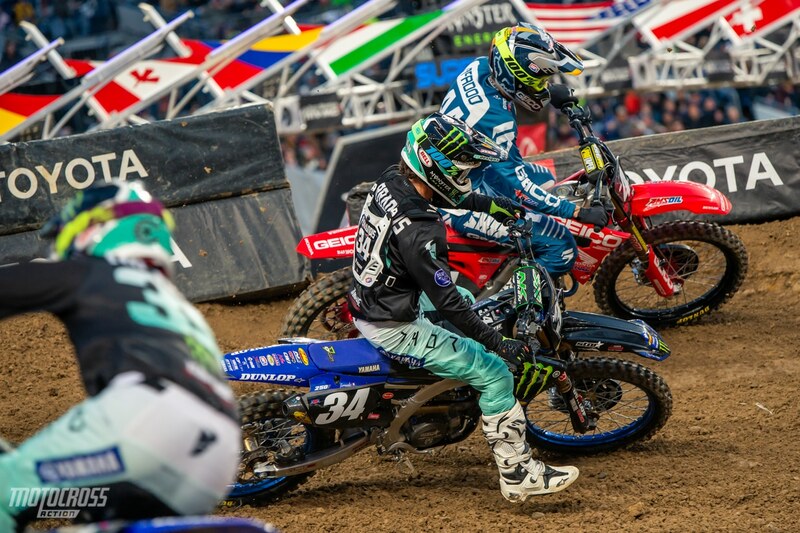 Eli Tomac and Cooper Webb were both outside of the top five on the start, but their speed and aggressive moves allowed them to slice their way to the front. 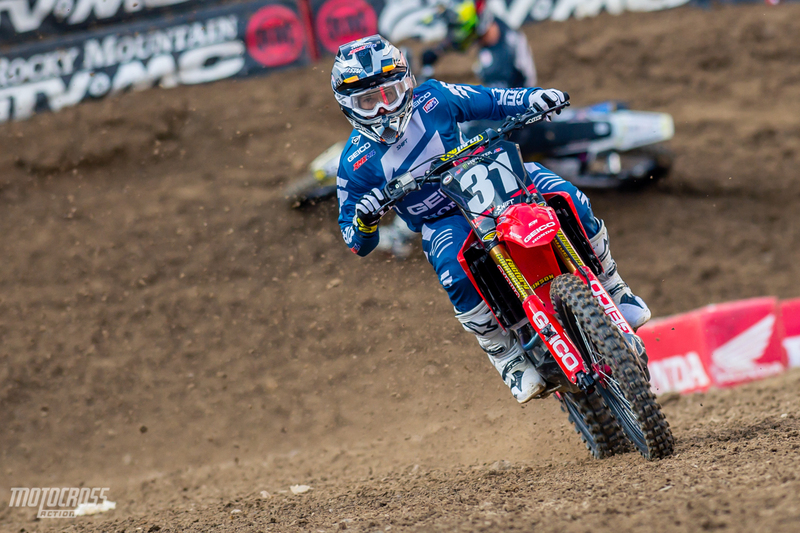 Eli Tomac was on another level in Colorado. He was riding with confidence knowing that he had more experience riding at high elevation and in cold weather than anyone else. When the main event started, he was sixth early in the first lap, but he put on a charge. He passed into the lead before lap seven and he never looked back. Although he did look over at the fans to celebrate on the final lap. 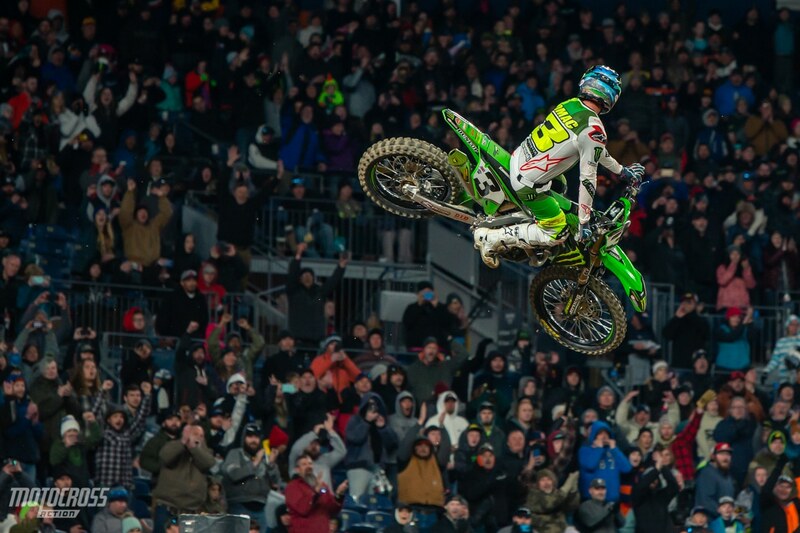 The fans went crazy for their Colorado Superstar, Eli Tomac. 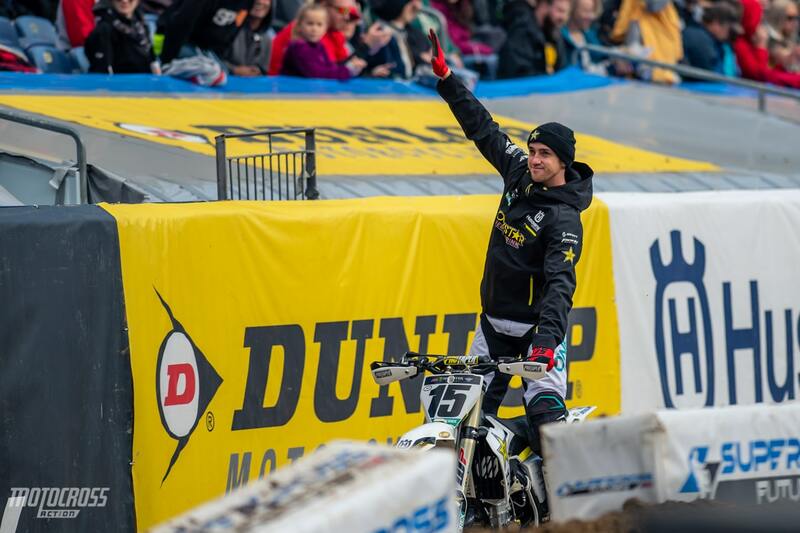 Unfortunately Dean Wilson went down hard in Denver. Dean was running in eighth place at the beginning of the main when he crashed in a rhythm section. He laid on the track for a full lap which caused the red cross flag to come out through that section for one lap. So far nothing official has been announced about Dean’s injury. Cooper Webb started out slow in the 450 main. 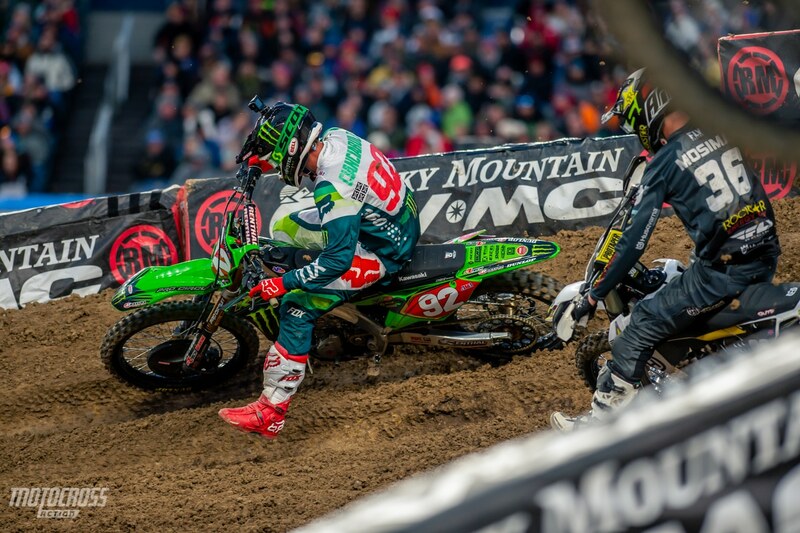 Joey Savatgy was putting up a strong fight and he was making it a big challenge for Cooper to get around him. Finally Cooper got into third on lap 13 and it seemed like he would settle for the final spot on the podium. 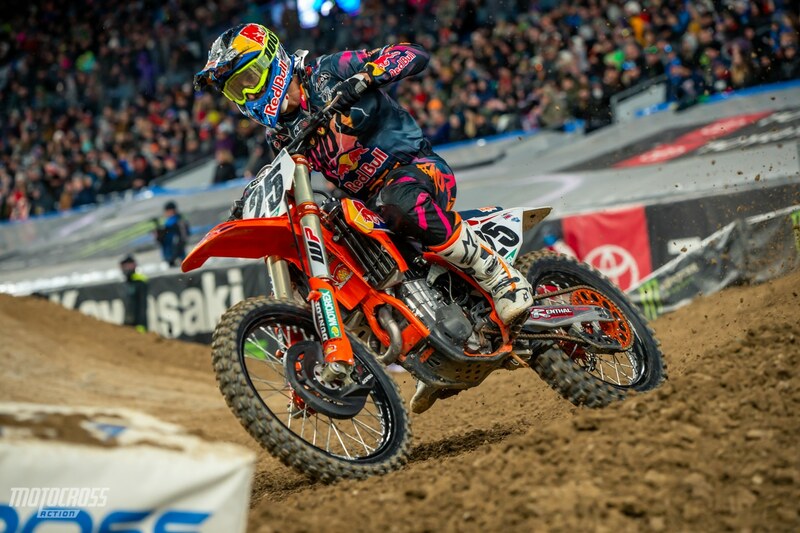 But that wasn’t the case, Cooper kept charging and he caught up to Marvin Musquin and passed him on lap 21 of the 28 total laps. Justin Bogle wheelies in front of the pack on the start of the first 450 heat race. 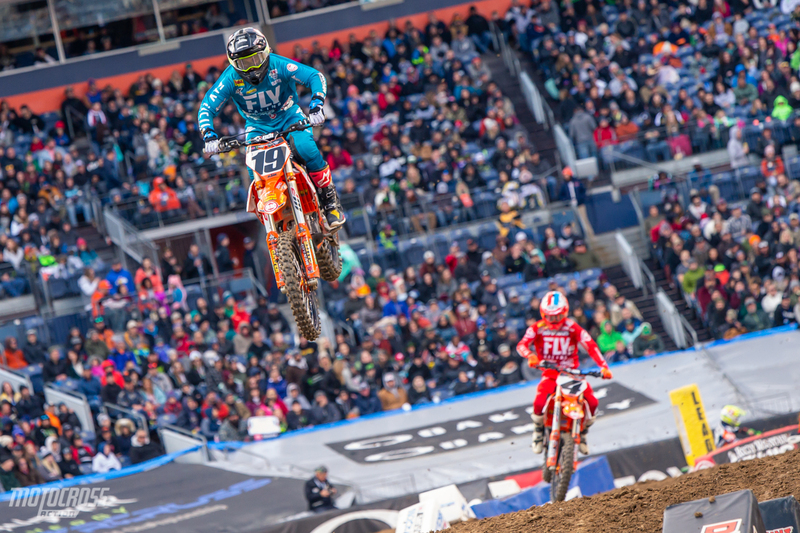 After starting the season with almost no experience on the KTM, it’s clear that Justin Bogle is finding his groove. 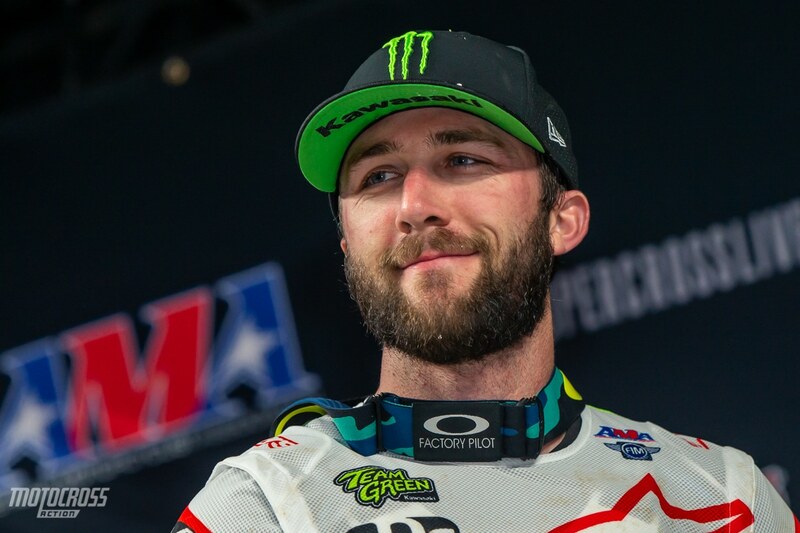 He grabbed the holeshot and won the first 450 heat race of the night and then he grabbed a third place start in the main event and rode a solid main event to finish fourth place. 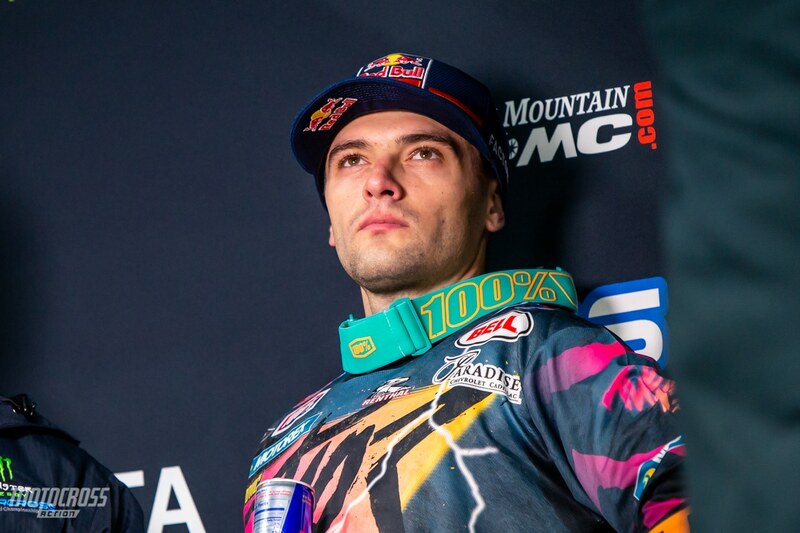 We interviewed the Rocky Mountain KTM fill in rider on Friday before the race, check out the video by clicking here. 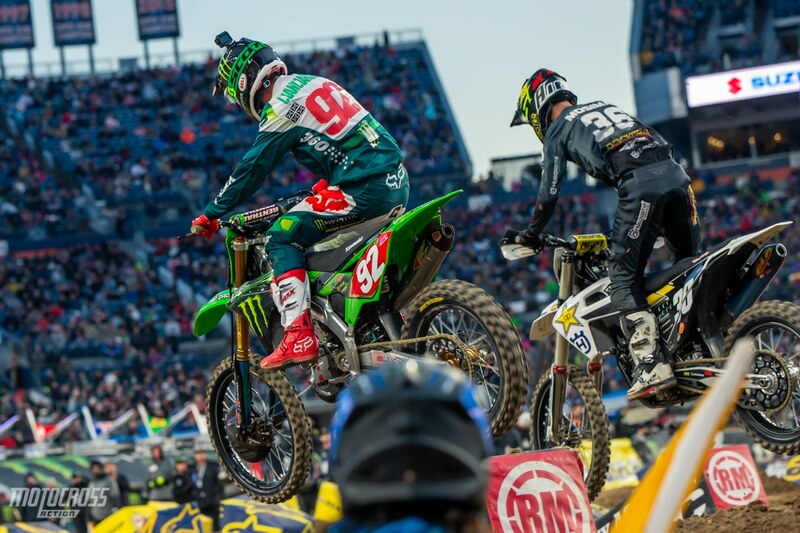 Even after crashing one week ago in Nashville and dislocating his shoulder, Joey Savatgy was able to push through the pain and run up front in Denver. He qualified third, placed fourth in his heat race and fifth in the main event. 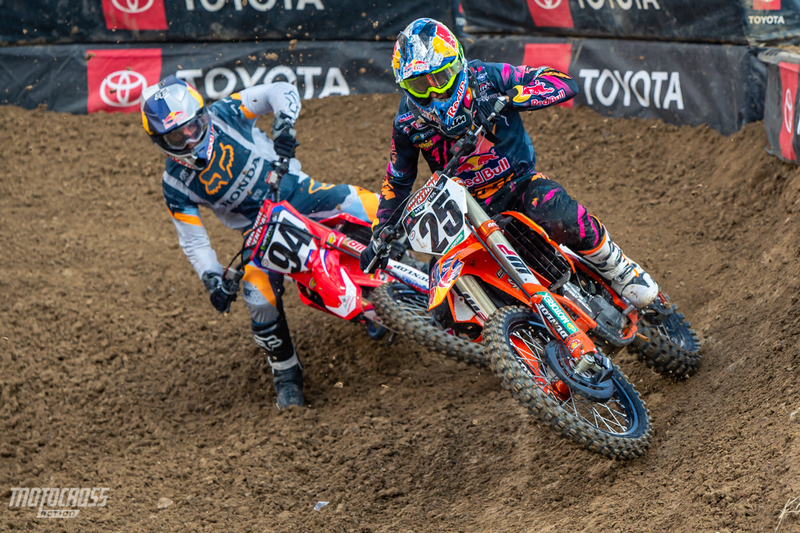 Marvin Musquin and Ken Roczen had a good battle in the heat race, but Ken Roczen was off the pace in the main event. 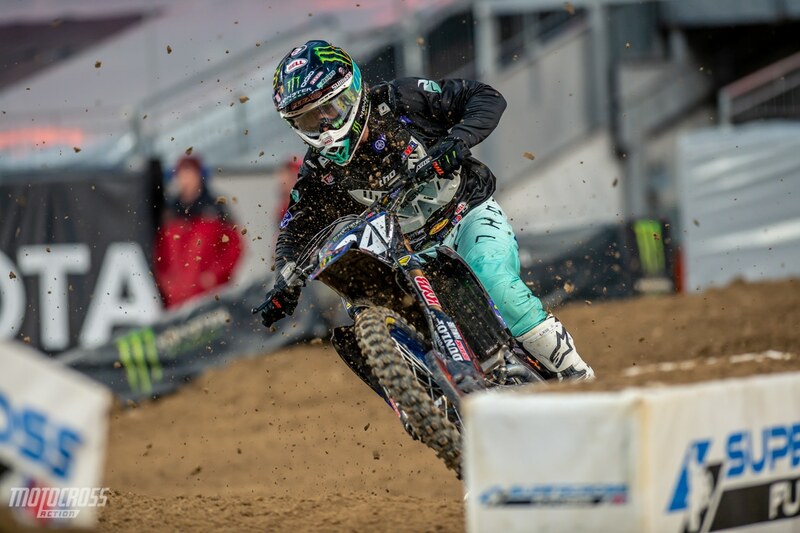 Ken finished seventh behind Blake Baggett. 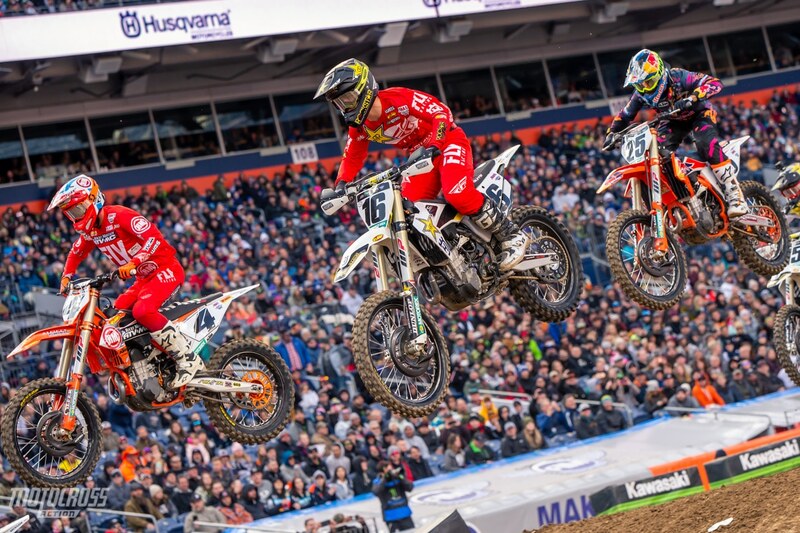 Zach Osborne, Blake Baggett and Marvin Musquin share airspace during the first heat race in Denver. Justin Bogle would win this heat with Zach Osborne second and Blake Baggett third. 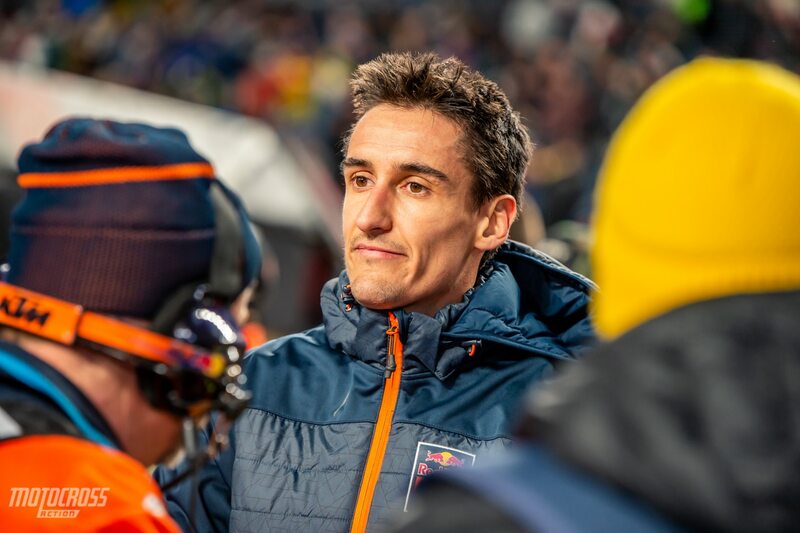 Marvin Musquin would eventually get passed by Ken Roczen who finished fourth in the heat. The Colorado native knows how to dress for the cold 35-45 degree weather in Denver. 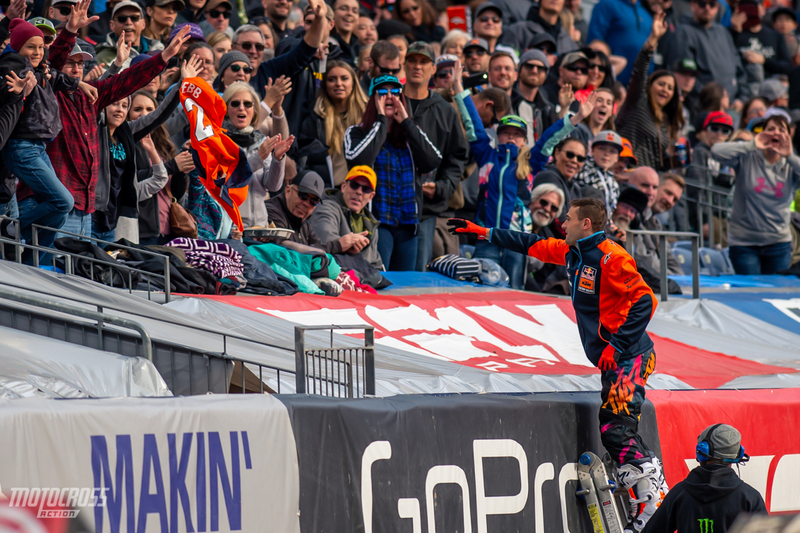 Cooper Webb tosses a Denver Broncos jersey with his name and number on it into the crowd. 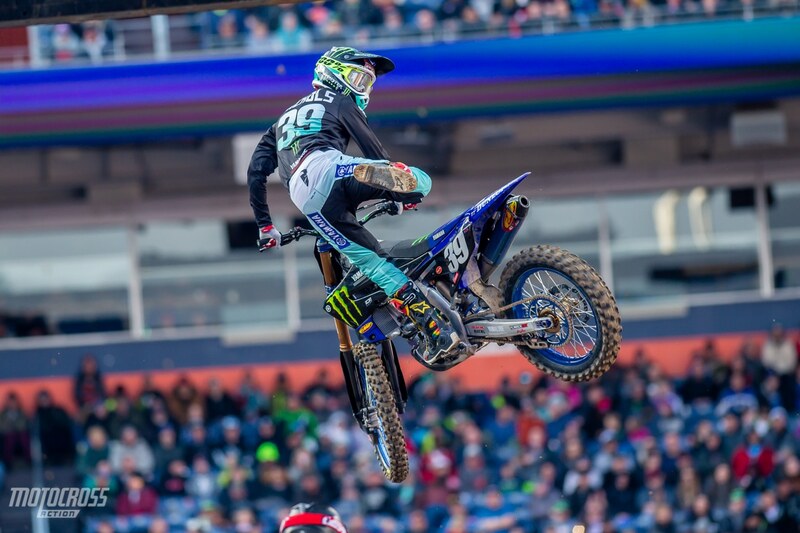 With two rounds left in the 2019 Monster Energy Supercross season, Cooper Webb maintains an 18-point lead over Eli Tomac in the overall point standings. 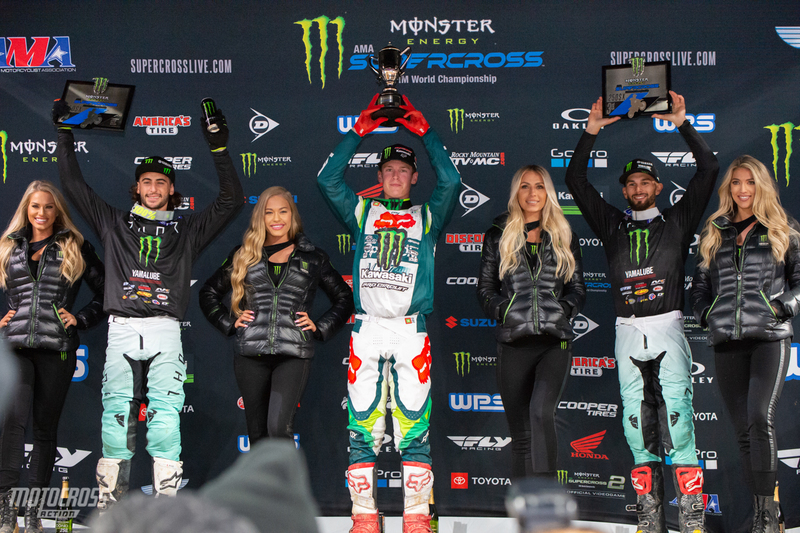 After a rough race in Houston, Adam Cianciarulo bounced back to claim the win and extend his points lead by 3 in Denver. 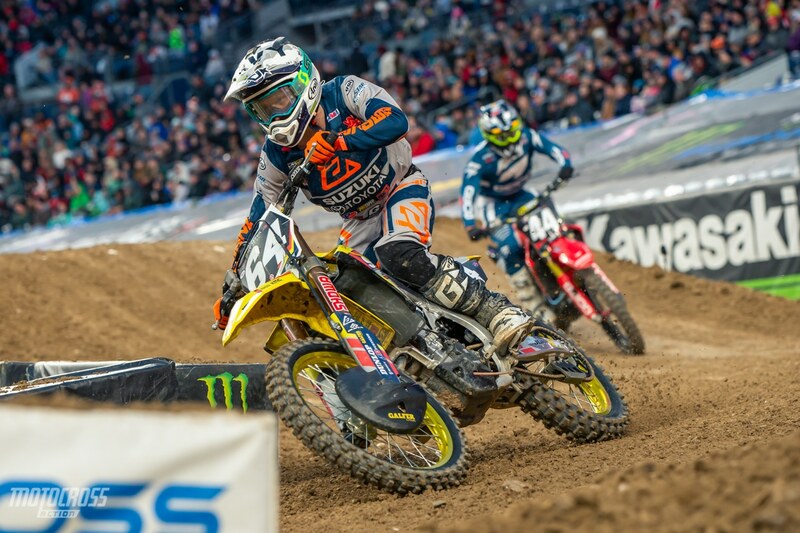 Dylan Ferrandis won the last two in a row, but in Denver he finished second and Colt Nichols would land on the podium again in third. Michael Mosiman grabbed the holeshot and the early lead in the 250 main event. 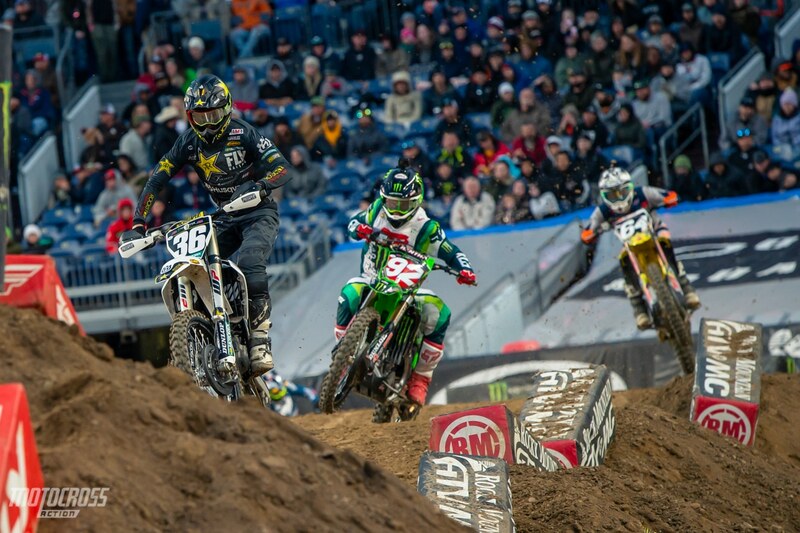 Adam Cianciarulo was second and Jimmy Decotis #64 was third. Cameron McAdoo started in fourth place with Dylan Ferrandis and Colt Nichols behind him. 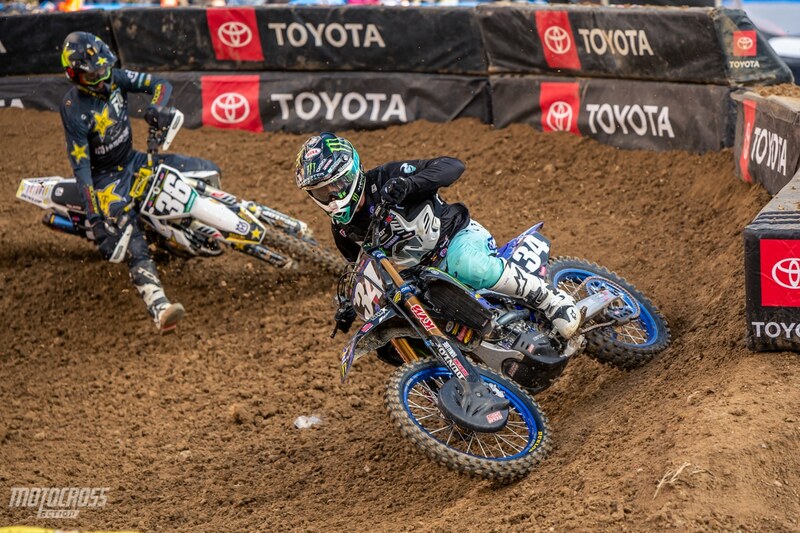 Here Ferrandis cuts down to make the pass on McAdoo in the corner before the whoops. Michael Mosiman lead for the first six laps of the main event. 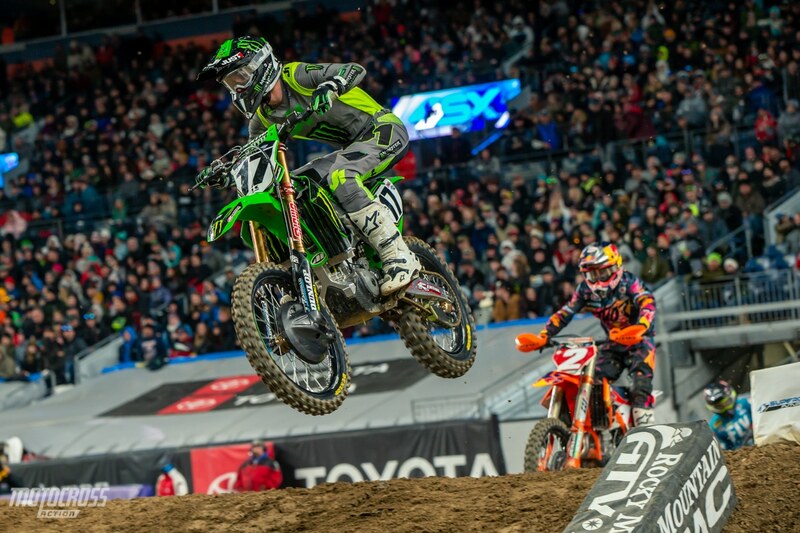 Adam Cianciarulo was second and most people thought that Adam would make quick work of Mosiman. But the 19-year old Rockstar Husqvarna rider was able to put up a strong fight. Eventually Adam passed Michael, but then Michael was able to get up next to him and pass him right back for a brief moment. After Cianciarulo got around Michael Mosiman, it was Dylan Ferrandis’ turn. Michael was able to hold Dylan off and run second for six more laps until the Frenchman got by. 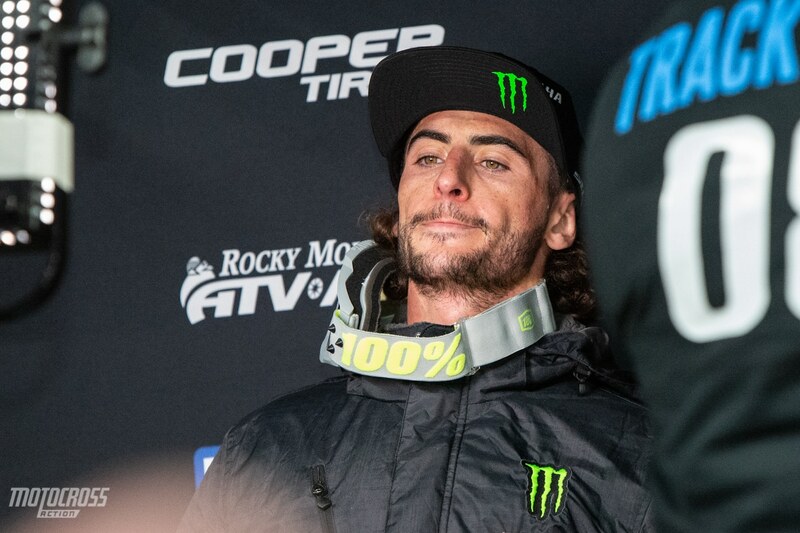 Dylan Ferrandis took too long to get going in the main event, he was never close enough to put pressure on Adam Cianciarulo. Dylan finished second and lost 3 more points to Adam in the Championship. Now with only the East/West shootout left, Adam Cianciarulo holds an 8-point lead over Dylan Ferrandis. Jimmy Decotis, Cameron McAdoo #44 and Michael Mosiman are all tied for fifth place in the 250 West Point standings with 128 points. 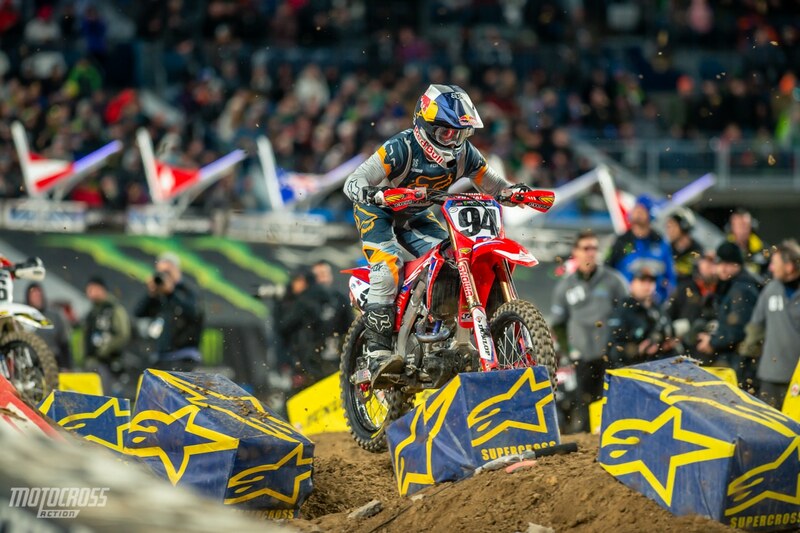 After finishing second in Houston, Rj Hampshire had another good finish in Denver. He block passed Michael Mosiman in the final corner to finish fourth. Colt Nichols celebrated his heat race win with a nac-nac look-back. 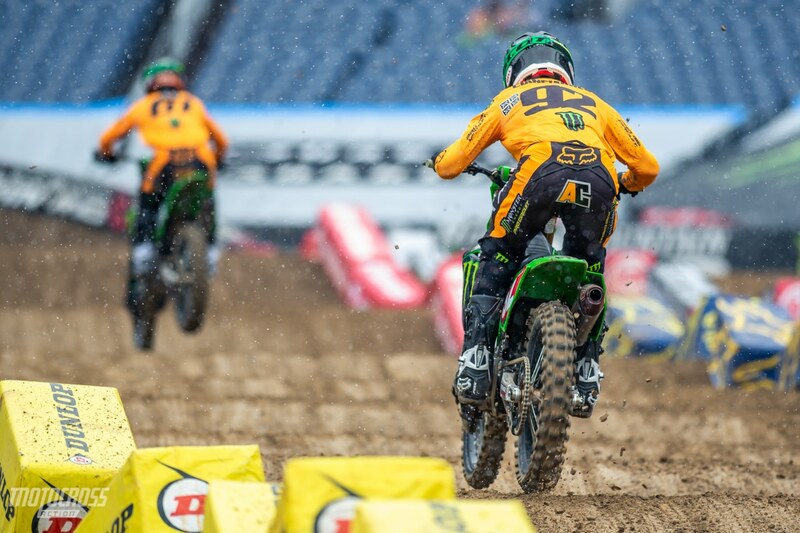 As you can tell, the whoops were very slick in Denver. This shot was from the first time-qualifying session when the snow was falling. Slippery whoop sections require a great amount of throttle control to be able to get through without making a mistake or crashing.